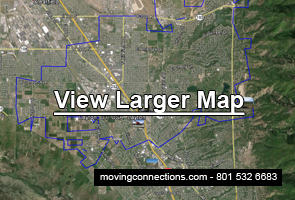 If you want to make the right move, then make your move with Moving Connections, Northern Utah’s premier moving service provider. Moving Connections is a Moving Company offering the most in professionalism while remaining a down to earth local moving company. We can make this claim because we are an affordable moving company that charges a fair price and gives an honest and transparent quote. At Moving Connections, you only pay for labor and partial driving time, plus some packing materials, usually just boxes and tape. And our rates are very competitive, especially when you consider the fact that Moving Connections is federally licensed, bonded, and insured. In addition, Moving Connections hires only those who are experienced in the moving industry for our moving crews. This means that you don’t have to worry about down time due to employees trying to figure out how to do something that an experienced mover already knows. If Moving Connections is moving you to Layton it's a perfect time to begin to utilize the many resources and bounties of Layton. For example click on the picture to the left to go the Moving Connections 'Support - Advice - Assistance' page and discover Layton for the first time. Once you are on the 'Support - Advice - Assistance' page go ahead and open the .pdf link found there and tape the list of emergency and useful phone numbers on your refrigerator. Moving Connections has gone to great pains to find those links and connections to integrate you quickly into Layton life. Moving Connections has been providing shipping and professional moving services to Utah families and individuals for more than three decades. That’s why we can sympathize with those who are going through the throes of moving. We know that it can be emotionally trying, as well as taxing on one’s patience as you try to attend to a thousand and one details that have to be taken care of “right now”. That’s why Moving Connections is a Moving Company offering a full service move for those who want the peace of leaving the hassles up to the professional movers. With this move option, two professional moving team members will show up in a clean truck that is professionally stocked with approximately 100 moving blankets and pads, plus all the stretch wrap, tape, and boxes that you will require for your move. To make your Layton residential move go faster and more smoothly, Moving Connections hires only experienced professional moving crews. And we are federally licensed, bonded, and insured. On top of that, Moving Connections has a straightforward pricing policy: you pay for our team’s time, plus boxes and tape. We don’t charge any add-on fees, no taxes, no fuel surcharges, and we don’t even charge for stretch wrap. Moving Connections is sensitive to the budget concerns of Utah families. That’s why we offer a “labor only” move option in which you provide the truck (usually a rental), and you do most of the packing of the household goods, and Moving Connections provides the muscle for the very heavy and unwieldy items, such as gun safes and chandeliers. This moving service allows you the option to save money by doing much of the labor yourself, plus all of the driving. Moving Connections considers this a “win-win” moving service because it saves you money and it saves us time. If you would like to know more about the “labor only” moving option, then give us a call, or if you’re reading this on a mobile device, then please click here and you’ll be connected to one of our moving service representatives who will be happy to answer your questions about this or other options. And doesn’t it give you peace of mind to know that Moving Connections is a federally licensed professional moving service that is bonded and insured in accordance with federal regulations? Not only are we federally licensed, but we also hire the best crews in the moving business. All of our crew members are experienced movers. This means that you will get the most efficient and safest moving team personnel when you hire Moving Connections for your Layton corporate relocation.